Owing to the wide experience of this domain, we are instrumental in offering Air Erasable Pen (Hot Air Erasable Pen) to our clients. Use: Perfect for marking your fabric for sizing or altering etc. This Air Erasable Fabric Pen Pen is broadly demanded for its diverse application area in garment, shoe and craft manufacturing industries. Air Erasable Pens, Violet and Pink disappears spontaneously and is erasable by water. But, if you wish to erase it hurridly, use the eraser and the colour will disappear in a moment.Ink is non toxic. Magic Air Erasable Pen is used to create erasable markings on different surfaces. The markings created by this pen can be easily removed. Owing to the wide experience of this domain, we are instrumental in offering Air Erasable Fabric Pen to our clients. 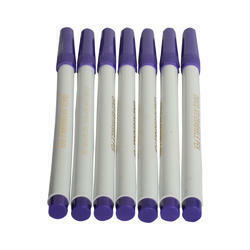 The Air Erasable Pen provided by us is used to create erasable markings on different surfaces. The markings created by this pen can be easily removed.